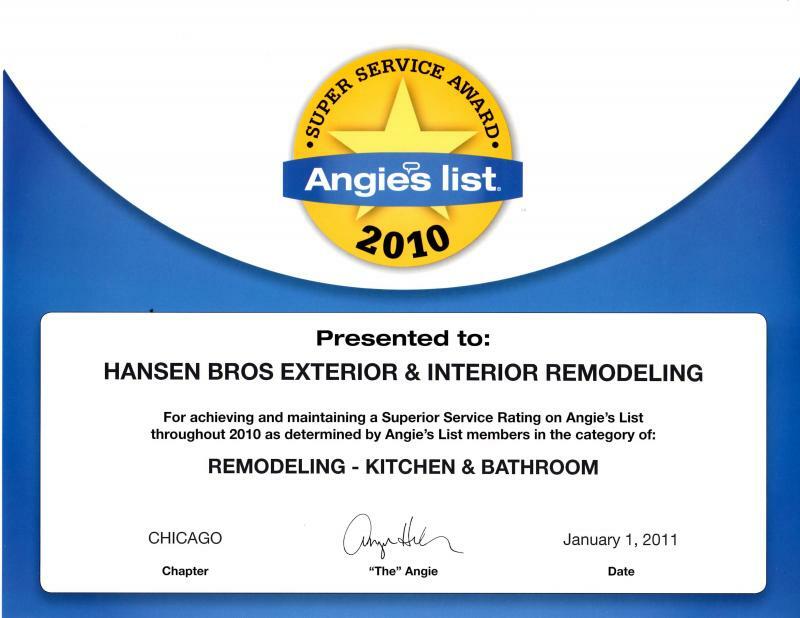 Hansen Brothers have been winning Super Service Awards since joining Angie's List in 2009. You should always ask for references when looking for a reliable contractor. Check out our Angie's List awards and feel free to see more on the Angie's List website. References from customers old and new are available on Angie's List. Most of our customers come from word of mouth referrals. "The job went great from initial consultation to completion of the project. Bob Hansen (owner) made the initial inspection of the space and gave great ideas for how to make it look great and be functional for our needs. He followed up right away with a bid on the project. Bob is very knowledgeable, honest and strives to please the customer. His crew is friendly and hardworking. They were always on time and did the best they could to keep our house as clean as possible during the demolition and construction. We are very happy with the results and would use Hansen Bros. again for other remodeling projects. I highly recommend their work." "Bob had done another smaller job at my house last fall and pointed out to me at the time that the brick front of my house was badly in need of repair. I contacted him at the end of the winter and he came out and explained what needed to be done in detail and how much it would cost. I contacted him when I was ready to do the job and he came out as scheduled and completed the job as promised. I can see the great improvement in the condition of the front of my home and am glad that the repairs were made before I suffered any damage to my home. Bob takes the time to explain the job, is very responsive and easy to work with. I would call him in the future." "Bob & his crew has done an exellent job taking care of some building code violations, working with the lawyer, the architect, & the Chicago building dept. to get the problems taken care of. They can do most anything at a reasonable price." Copyright 2011 Hansen Brothers Inc. All rights reserved.